Euclid was a geometer, mathematician and perhaps a Platonist [i] whose floruit occurred between 325 and 250 B.C., but what information scholars posses about Euclid's life is at best unreliable. He likely taught in Alexandria Egypt during the reign of Ptolemy Soter (323-285 B.C.) and has been considered a great schoolmaster as well as a man of the utmost honesty. [ii] The most prominent mathematician of the Graeco-Roman period, he is best known for his work Elements, and largely relegated to the status of geometer. Other preserved works are Optica, Catoptica, Sectio Canonis and Phaenomena, all of whom together demonstrate that Euclid knew the whole range of mathematics and mathematical topics of his day. [iii] Indeed he seems to have culminated all that came before him in his work. Though he covered other material in other works, his Elements is far from simply geometry. Euclid's aim in Elements was to make geometric proofs using only a compass and a ruler and to establish a theory of numbers; thus with limited tools, he produced a highly sophisticated work. iv Geometry was meant to be simple at its root and therefore beautifully structured, which reflected the Greek sense of virtue in general. Euclid may have made certain proofs on his own, but he also compiled the work of earlier thinkers into Elements, proving their theories perhaps more vigorously. Thinkers were not obliged to cite sources in the way modern scholars do, and so Elements is perhaps the legitimate culmination of geometry and some mathematics, but it is not the work of a titanic genius, as may be supposed. It is at least the work of a genius compiler who proved theories that already existed, theories that had not been proven as vigorously and in conjunction with one another. Make no mistake; Elements is a work of genius. Yet, Euclid's contribution must be put into perspective. Not only is he not responsible for all of the proofs in Elements, but he may not be responsible for the majority of them. There is no way to extract fully what Euclid adds to what already existed. Still, scholars have some idea who contributed to his work and basically what that constituted. One must think of Elements as an enormously successful textbook, [v] sometimes mistakenly giving readers the impression that Euclid discovered a titanic multitude of proofs and truths. The method Euclid employs is an axiomatic one, [vi] and that means he makes use of fundamental, atomic propositions that he uses to build a very powerful system, beginning with the easier material and progressing methodically into complicated proofs. [vii] Atomic propositions are statements considered to be self-evident, like the old metaphor of building blocks. Once one acknowledges these statements as true the rest of Euclid's system follows because he reasons in a deductive manner. His proofs are composed of long combinations of accepted truths and logical connections. These connections make propositions. In fact, Euclid makes a proof for one proposition and uses that as an element for another, later proof. His way of making an argument [viii] is thus thorough and meticulous, sometimes seemingly tedious, but all of the pieces need to be arranged in order to build a strong edifice. [ix] And his construction is so strong that it lasted until late in the nineteenth century when alternate geometries gained traction in the academic community. [x] One anecdote [xi] from the ancient world speaks to the rigor and potency of Euclid's work. He was asked by Ptolemy the king if there was not a shorter road to geometry than through his Elements. His response was that there is no royal road to geometry. Another anecdote speaks to what one may obtain from studying geometry. Euclid was asked by one of his students what profit there is to gain from the study of geometry. He called a slave and told him to give the student a coin or two, since he must profit from what he learns. Euclid's Elements may seem sometimes tedious, but it is beautiful and true, profitable and useful in itself – powerful indeed. It is appropriate here to acknowledge the work of the thinkers and scholars on whose work Euclid built his famous text. They are, after all, responsible for his success in a most significant way. Elements is composed of thirteen books, [xii] beginning with simple proofs and graduating to more difficult ones. Euclid drew from Aristotle at least one of his most fundamental axioms, but he may have used a great deal more. [xiii] Hippocrates of Chios whose floruit comes c. 440 B.C. wrote the first known Elements of geometry a century before Euclid wrote his Elements. Hippocrates attempted to “square the circle” and portions of his Elements have been preserved in the work of Proclus, a Greek philosopher. Perhaps the whole idea of a book of geometric elements came from Hippocrates. The Pythagorean Theatetus who lived from 417-369 B.C. contributed a great deal of material from which Euclid wrote the later books of his treatise: XI–XIII three-dimensional figures, XI intersections of planes, lines, and parallelepipeds (solids with parallel parallelograms as opposite faces), and XIII the construction of the five regular Platonic solids (pyramid, cube, octahedron, dodecahedron, icosahedron) in a given sphere. Eudoxus of Cnidos whose floruit occurred c. 395/390–342/337 B.C. was another significant contributor. Book XII of Euclid's Elements consists in part of Eudoxus’s method of exhaustion, which Euclid used to prove that areas of circles are to one another as the squares of their diameters. Also Euclid used Eudoxus' work to prove that the volumes of spheres are to one another as the cubes of their diameters. Book I of Elements lists twenty-three definitions, five unproved axioms and five more unproved assumptions. Euclid called the axioms “postulates” and the unproved assumptions “common notions”, but it is best to define our terms in order to be as orderly as possible. An axiom is a self-evident truth about something, an assertion that everyone agrees is true. It needs no proof. The term comes from the Greek axioma, which means “worthy.” A postulate is simply asserted as true but it lacks the self-evident nature of an axiom. It is as if Euclid were to say that he wants his readers to take this assertion as true, and he employs that assertion as a truth. There is no need to prove a postulate, though perhaps a proof will make a postulate stronger. These assertions are sometimes intuitive, and sometimes simply asserted for purposes of making a proof, but without doubt they are necessary as atomic elements of each line of reasoning. We will see that there are some proofs of things that we would take as truth without proof, but Euclid knew that he needed to prove every item. Again his attention to detail of this kind leads some to see his work as tedious, but the so-called tedium is quite necessary. [xiv] Many of the postulates are self-evident, but most are provable. [xv] First, here are Euclid's definitions [xvi] from book I of Elements, which make clear what terms mean what. A point is that of which no part exists. And a line is length with no breadth. And the extremities of a line are points. A straight-line is whichever one lies evenly with points on itself. And a surface is what has length and breadth alone. And the limits of a surface are lines. A plane surface is whichever lies evenly with the straight-lines on itself. And a plane angle is the bending of the lines to one another, when two lines in a plane meet one another, and are not lying in a straight-line. And whenever the lines containing the angle are straight, the angle is called rectilinear. And whenever a straight-line stood upon (another) straight-line makes adjacent angles (which are) equal to one another, each of the equal angles is a right angle, and the former straight line is called a perpendicular to that upon which it stands. An obtuse angle is an angle greater than a right-angle. And an acute angle (is) an angle less than a right-angle. A boundary is that which is the limit of something. A figure is that which is contained by some boundary or boundaries. A circle is a plane figure contained by one line [which is called a circumference], (such that) all of the straight lines falling towards [the circumference of the circle] from one point among those lying inside the figure are equal to each other. And the point of the circle is called the center. And a diameter of the circle is some straight-line, drawn through the center, and terminated in each direction by the circumference of the circle, (and) whichever (straight line) also cuts the circle in half. And a semi-circle is the figure contained by the diameter with the circumference cut off by it (the diameter). And (the) center of the semi-circle is the same thing as (the center of) the circle. 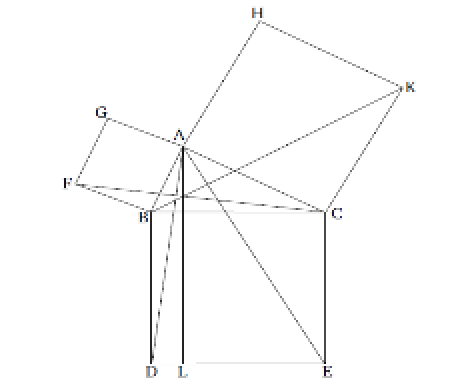 Rectilinear figures are the ones (figures) contained by straight-lines: trilateral figures (being) the ones contained by three straight-lines, quadrilateral by four, and multilateral by more than four. And of the trilateral figures, an equilateral triangle is the one having three equal sides, an isosceles (triangle) the one having only two equal sides, and a scalene (triangle) the one having three unequal sides. And further of the trilateral figures, a right-angled triangle is the one having a right angle, an obtuse-angled (triangle) the one having an obtuse angle, and an acute-angled (triangle) the one having three acute angles. And of the quadrilateral figures, a square is the one which is right-angled and equilateral, a rectangle the one which is right-angled but not equilateral, a rhombus the one which is equilateral but not right-angled, and a rhomboid that having opposite sides and angles equal to each another which is neither right-angled nor equilateral. And let quadrilateral figures besides these be called trapezia. Parallel lines are straight-lines which, being in the same plane, and being extended to infinity in each direction, meet with one another in neither (of these directions). To draw a line from any point to any point. To draw a circle with any center and distance. Things which are equal to the same, or to equals are also equal to one another. If equals be added to equals, the sums are equal. If equals be taken from equals, the remainders are equal. Things which coincide with each another are equal to each another. The definitions, postulates and axioms function together as the foundation of Euclid's axiomatic proofs, but it is important to note that each book – with the exceptions of 8, 9, 12 and 13 – has definitions. One will remember that Pythagoras talks about the relationship of sections on a chord that produce a similar sound. The ratio of ½ is an eighth, but one must begin at a particular point in order to determine the ratio. One cannot begin at 0. Once the point on the line of the chord is determined, one is able to determine where are the other eighth tones because the point on the line that lies a specific distance from another point has a similar sound. Yet, one must begin at some point in order to make the determination. Beginning at 0 leaves no possibility to make a ratio because there is no measure. In other words, ½ of zero is zero, so one moves to no other point on the chord. The definitions, postulates and axioms of Euclid operate in a similar fashion in his Elements. They supply the reference points for an analysis of figures in two and three-dimensional space, a starting point that allows the system to begin and founds it. Notice as well that such systems of reasoning are relative. They, like all reasoning, need a reference point from which to understand the system. Otherwise, like beginning at zero there is nothing from which one proceeds. Euclid's system of measurement and logic produces quite strong proofs of the certainty of many geometric figures and shapes, though some moderns have found fault with his methods and proofs. His method is fully deductive and it is not until the nineteenth century that logicians and geometers realize they are able to begin a new system of reasoning by beginning at different reference points. Euclid's proofs were taken as certain for that long, and it is important to remember that his proofs are not proofs in the sense that they make reasoned hypotheses and later prove them with empirical evidence in the traditional sense. [xviii] They are more pure reasoning and “prove” something in the sense that they demonstrate how specific aspects of figures and shapes can be realized with mathematical precision and logical certainty. A proof will demonstrate that one can be certain about what amounts to outlines of objects encountered in the universe. They demonstrate precise measurement and relationships between lines, points and space. There are no more clear arguments, though perhaps Euclid's geometric system is not the only way to measure figures. Book I of Elements proves elementary theorems about triangles and parallelograms, culminating in Euclid's proof of the Pythagorean theorem. Book I also contains the famous pons asinorum, [xix] beyond which good students may pass but past which bad students cannot. Recall that Aristotle's syllogisms individually are three statements long. Each syllogism may be coupled with other syllogisms in order to form longer arguments, but the fundamental arguments are composed of three lines. Euclid's arguments may be three lines, but they may also be much longer, and that longer proof may become an element of another, more sophisticated, argument. Our concern will be showing how the various proofs can be used together. We concentrate on Book I, which culminates in Euclid's proof of the Pythagorean theorem. His proof of the Pythagorean theorem is itself comprised of propositions 4, 14, 31, 41 and 46. On a given finite straight line to construct an equilateral triangle. Let the given straight line be AB. There is need then to construct an equilateral triangle on the straight line AB. Let the circle BCD be drawn with center A and radius AB [Post. III], and again let the circle ACE be drawn with center B and radius BA [Post. III]. 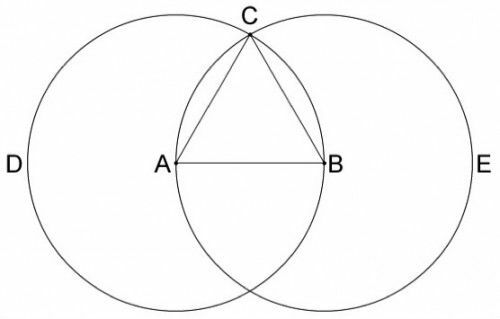 And let the straight lines CA and CB have been joined from the point C where the circles cut each other to the points A and B (respectively) [Post. I]. And because point A is the center of the circle CAE, BC is equal to BA [Def. 1.15]. But it was shown that CA is equal to AB. Thus, CA and CB are both equal to AB. Things equal to the same things are equal to each other, and CA then is equal to CB. Thus, the three CA, AB, BC are equal to each other. Therefore, the triangle ABC is equilateral, and has been constructed on the given finite, straight line AB, the very thing there was need to do. Notice that postulates 3 and 1, definition 15 and axiom 1 are each pieces of the proof. Each has been taken as an accepted truth, and each supports the overall demonstration of how one may be certain to construct an equilateral triangle. The certainty of the radius of a circle is a part of constructing the triangle within the circle. In fact, the triangle is merely the radius of two interlocking circles, and this certainty is deductive in the modern sense. That is, if one accepts the premises of the proof, one must accept the conclusion. Here is clear, confident certainty, and practical application of the shape into spatial extension is possible on multiple levels. So, Euclid's proof is both deductively certain and utilitarian. Proposition 4 demonstrates that if two triangles share a corresponding side angle and side, then they are congruent: Book I, Proposition 4. If two triangles possess two sides equal to two sides, each (equal) to each one, and possess angles contained by equal straight lines equal, then they will possess the base equal to the base, and the triangle will be equal to the triangle, and the remaining angles will be equal to the remaining angles, each (equal to) each one, under which the equal sides will stretch. 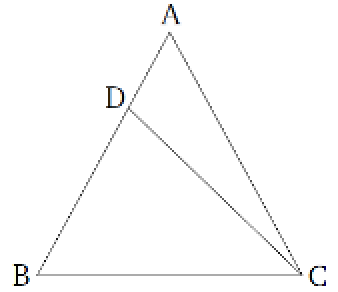 Let ABC and DEF be two triangles having the two sides AB and AC equal to the two sides DE and DF, each one (equal to) each: AB to DE and AC to DF. And let the angle BAC (be) equal to the angle EDF. I say that the base BC is equal to base EF, and the triangle ABC will be equal to triangle DEF and the remaining angles will be equal to the remaining angles, each one (equal to) each, under which the equal sides will stretch: ABC (equal) to DEF, and ACB (equal) to DFE. For when triangle ABC is applied to triangle DEF and point A placed upon point D and the straight line AB on DE, point B will coincide with point E on account of the equality of AB to DE. With AB coinciding with DE, the straight line AC will coincide with DF as well, on account of the equality of BAC to EDF. The result will be that the point C will coincide with the point F again on account of the equality of AC to DF. But, point B coincided certainly with point E, so that the base BC will coincide with the base EF. For if B coincided with E and C with F, and the base BC will not coincide with EF, two straight lines will encompass an area, the very thing that is impossible [Post. 1]. Therefore the base BC will coincide with EF, and will be equal to it. The result is the whole triangle ABC will coinicide with the whole triangle DEF and will be equal to it. And the remaining angles will coincide with the remaining angles and will be equal to them: ABC (equal) to DEF and ACB (equal) to DFE. Therefore if two triangles possess two sides equal to two sides, each (equal) to each, and possess the angle(s) enclosed by equal straight lines equal to (their) angles, they will have their base equal to their base and the triangle will be equal to the triangle. And the remaining angles will be equal to the remaining angles each (equal) to each, under which the equal sides stretch, the very things that it was necessary to demonstrate. Again, the proof consists of other pieces from Elements: postulate 1, axiom 4 etc. The notion that the triangle is congruent seems obvious, but Euclid demonstrates precisely how it is true that they coincide based upon his definitions axioms and postulates. Proposition 4 has an element of indirect proof but proposition 6 we include because it is at its core an indirect proof. Indirect proofs have been a large part of logical and mathematical reasoning for many centuries. The idea is that if one assumes the opposite of what one wishes to prove and if a contradiction follows, then the opposite of what one has assumed must be true. If we want to prove that when the snow falls Charles will shovel our sidewalk, then we assume that Charles does not shovel when the snow falls. But what we know of our contract, the premises of the argument, is that we pay Charles to shovel snow; Charles is reliable and always comes when the snow falls; all is in order in our contract with Charles. These are all the things in the universe that exist as far as Charles shoveling snow is concerned. So, there are two possibilities in our snow-shoveling universe: Charles will shovel snow, Charles will not shovel snow. If we assume that Charles will not shovel snow, then we arrive at an absurdity, or in other words a contradiction, because everything about our universe indicates that Charles will shovel snow. We have a contract; he is reliable; snow has fallen; all is in order with the contract. So, given the contradiction we can assume that our belief that Charles will not shovel snow is incorrect. The conclusion flies in the face of all the things that we know about the situation. Thus, the opposite must be true: Charles will shovel the snow. This kind of proof seems initially perhaps not as rigorous and perhaps a bit too indirect, but it has been used and is now used regularly when a proof of a problem is perhaps too cumbersome, or even if the route through a direct proof does not seem possible. Book I, Proposition 6: If the angles of a triangle are equal to each another, then the sides stretching under the equal angles will be equal to each another as well. Let ABC be a triangle having the angle ABC equal to the angle ACB. I say that side AB is equal to side AC as well. For if AB is unequal to AC then one of them is greater. Let AB be greater. And let DB, equal to the lesser AC, have been cut off from the greater AB [Prop. 1.3]. And let DC have been joined [Post. 1]. 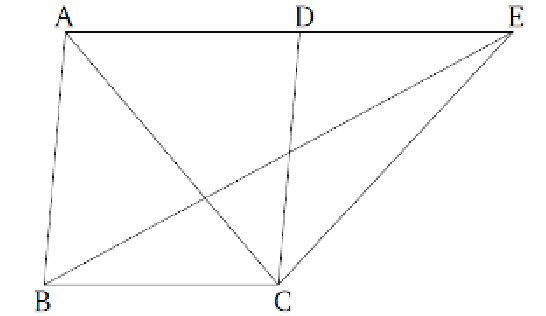 Therefore, because DB is equal to AC, and BC (is) common, the two sides DB, BC are equal to the two sides each to each, and the angle DBC is equal to the angle ACB. 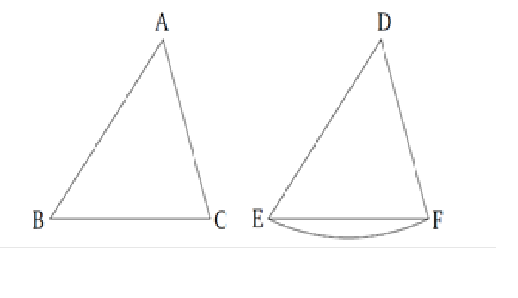 Therefore, the base DC is equal to the base AB, and the triangle DBC will be equal to the triangle ACB [Prop. 1.4], the lesser to the greater. The very notion (is) absurd [C.N. 5]. Therefore, AB is not unequal to AC. (It is) thus equal. Therefore, if the angles of a triangle are equal to each another, then the sides stretching under the equal angles will be equal to one another as well, the very thing it was necessary to demonstrate. Proposition 14 proves that if a straight line extends from two lines and the angles formed are congruent to two right angles, then the lines must be in a straight line with one another. Book I, Proposition 14: If two straight lines, not lying on the same side, make adjacent angles (the sum of which is) equal to two right-angles with some straight line, at a point on it, then the two straight lines will be straight on (with respect) to each another. For let two straight lines BC and BD, not lying on the same side, make adjacent angles ABC and ABD (the sum of which is) equal to two right-angles with some straight line AB, at the point B on it. I say that BD is straight on with respect to CB. For if BD is not straight on to BC, then let BE be straight on to CB. 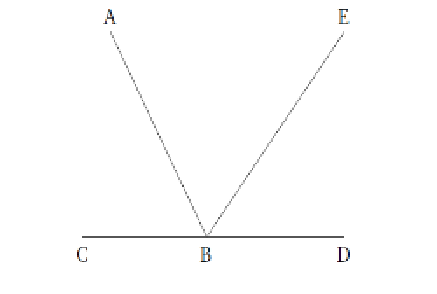 Therefore, because the straight line AB stands on the straight line CBE, the (sum of the) angles ABC and ABE is thus equal to two right angles [Prop. 1.13]. But (the sum of) ABC and ABD is also equal to two right angles. Therefore, (the sum of angles) CBA and ABE is equal to (the sum of angles) CBA and ABD [C.N. 1]. Let (angle) CBA have been subtracted from both. Thus, the remainder ABE is equal to the remainder ABD [C.N. 3], the lesser to the greater. The very thing is not possible. Therefore, BE is not straight on with respect to CB. Similarly, we will demonstrate that neither (is) any other (straight line) than BD. Therefore, CB is straight-on with respect to BD. If, therefore, two straight-lines, not lying on the same side, make adjacent angles (the sum of which is) equal to two right angles with some straight-line, at a point on it, then the two straight-lines will be straight on (with respect) to each another, the very thing it was necessary to demonstrate. This proof becomes one of the primary pieces of Euclid's proof of the Pythagorean theorem. It is another that seems obvious, but Euclid demonstrates that – given the acceptance of his postulates, definitions and axioms – it is always true, and it is the “always true” that matters in the construction of proofs. If proposition 14 were sometimes true, then obviously we would have a foundation that sometimes did and sometimes did not function properly. Proposition 31 proves that with any line and any point, one can always construct a parallel line through the given point. Again, the truth of this proposition seems obvious, but that it is always true is essential to constructing Euclid's system. Book I, Proposition 31: To draw a straight line parallel to a given straight line, through a given point. Let the given point be A, and the given straight line BC. It is necessary to draw a straight line through the point A parallel to the straight line BC. Let the point D have been taken randomly on BC, and let AD have been joined. And let (angle) DAE, equal to angle ADC, have been constructed on the straight line DA at the point A on it [Prop. 1.23]. And let the straight line AF have been produced in a straight line with EA. And because the straight line AD, (in) falling across the two straight-lines BC and EF, has made the alternate angles EAD and ADC equal to one another, EAF is therefore parallel to BC [Prop. 1.27]. Therefore, the straight-line EAF has been drawn parallel to the given straight-line BC, through the given point A, the very thing it was necessary to do. Proposition 41 states that if a parallelogram and a triangle have a base in common and are on the same parallel lines, then the parallelogram is congruent to double of the triangle. Here is a less obvious true statement about the relationship between to shapes. If we have determined that a parallelogram and a triangle have a base in common and are on the same parallel line, then we know something certain about the triangle and the parallelogram. Book I, Proposition 41: If a parallelogram possesses the same base as a triangle, and is between the same parallels, then the parallelogram is double (the area) of the triangle. For let parallelogram ABCD possess the same base BC as triangle EBC, and let it be between the same parallels: BC and AE. I say that parallelogram ABCD is double (the area) of triangle BEC. For let AC have been joined. The triangle ABC is equal to triangle EBC, since it is on the same base, BC, as (EBC), and in the same parallels, BC and AE [Prop. 1.37]. But, parallelogram ABCD is double (the area) of triangle ABC. For the diagonal AC cuts it in half [Prop. 1.34]. The result is that parallelogram ABCD is also double (the area) of triangle EBC. Therefore, if a parallelogram has the same base as a triangle, and is in the same parallels, then the parallelogram is double (the area) of the triangle, the very thing it was necessary to demonstrate. Once more, the certainty is what matters. Unfortunately, there is not enough space for it, but Book I, Proposition 46 proves that with any given line, one can always construct a square. Again, a proposition that proves one can draw a square seems hopelessly unnecessary, but that such figure has been proven possible is most important. The end-point of book I is a proof of the Pythagorean theorem. In fact, book I of Euclid's Elements culminates in this proof: Proposition 47. Book I, Proposition 47: In right-angled triangles, the square on the side stretching under the right angle is equal to the (sum of the) squares on the sides containing the right angle. Let ABC be a right-angled triangle possessing the angle BAC, a right angle. I say that the square on BC is equal to the (sum of the) squares on BA and AC. For let the square BDEC have been described on BC, and (the squares) GB and HC on AB and AC [Prop. 1.46]. And let AL have been drawn through point A parallel to either of BD or CE [Prop. 1.31]. And let AD and FC have been joined. And because each of angles BAC and BAG are right angles, then two straight lines AC and AG, not lying on the same side, make the adjacent angles with some straight line at the point A on it, (the sum of which is) equal to two right-angles. Therefore, CA is straight on to AG [Prop. 1.14]. On account of the same (reasons), BA is also straight on to AH. And because angle DBC is equal to FBA, for each is a right angle, let ABC have been added to both. Therefore, the whole (angle) DBA is equal to the whole (angle) FBC. And because DB is equal to BC, and FB (is equal) to BA, the two (straight-lines) DB, BA are equal to the two (straight-lines) CB, BF, each (equal) to each. And angle DBA (is) equal to angle FBC. Therefore, the base AD [is] equal to the base FC, and the triangle ABD is equal to the triangle FBC [Prop. 1.4]. And parallelogram BL [is] double (the area) of triangle ABD. For they have the same base, BD, and are in the same parallels BD, AL [Prop. 1.41]. And square GB is double (the area) of triangle FBC. For again they have the same base, FB, and are in the same parallels, FB and GC [Prop. 1.41]. [And the doubles of equal things are equal to one another.] Thus, the parallelogram BL is also equal to the square GB. Similarly, AE and BK being joined, the parallelogram CL will be shown (to be) equal to the square HC. Thus, the whole square BDEC is equal to the (sum of the) two squares GB and HC. And the square BDEC is described on BC, and the (squares) GB and HC on BA and AC (in turn). Therefore, the square on the side BC is equal to the (sum of the) squares on the sides BA and AC. Therefore, in right-angled triangles, the square on the side stretching under the right angle is equal to the (sum of the) squares on the sides surrounding the right [angle], the very thing it was necessary to demonstrate. The geometric shapes Euclid fashions are precise and exacted. Euclid seems to have believed he was proving something fundamental and unchanging about spatial relationships and about the relationships between lines. In fact, his notion of spatial relationships was taken to be true about space for thousands of years. It still is true to a large degree. Certainly the reliability and continued use of these proofs is testament to something that is always true about them. In fact, the Pythagorean theorem is used similarly to π and e=mc². It is itself a logical constant that can be relied upon as an atomic element in other calculations. Again, one cannot formulate an argument – mathematical or otherwise – without a reference point, and these constants provide the reference points needed. It is important to recall that Euclid's proofs are not evidence-driven. These proofs are axiomatic arguments that demonstrate how specific figures come to be in consistent and repeated patterns. He neither found them in the universe, nor claimed that he somehow was able to perceive these figures in their apparent perfection. They are deductive, mathematical “entities”, and so each proof can be relied upon to be true on every occasion, given specific conditions. There is no need for any of the proven shapes to exist as an object – or in other words become something that is born grows and perishes – in order for the proof about that figure to be true. There is something genuinely fixed and permanent about geometric figures, which was most probably why Plato had so much interest in them. Coming much later than Plato, Euclid takes two-dimensional figures and uses them in conjunction with one another to craft three-dimensional figures. This method seems simple, but it speaks to the unity of the second and third dimension in spatial relationships. They cannot do without one another. Euclid demonstrates the deductive organization of plane figures, lines and their relations and three-dimensional figures. He makes no outward claim about metaphysics or about organization of objects, not about movement of objects, nor about atoms. One is able to take Euclid's geometry as a more pure geometry and one is not forced into a specific theory. While Euclid himself may have believed in the material universe of Plato's Timaeus in some form, his system may have a great deal or nothing to do with Plato's reality. Euclid's system can be applied to many different conceptions of material or metaphysical reality. Such is its strength. Numbers as well as shapes and their relationships to one another Euclid uses in order to measure abstract things. These abstractions have practical value, but they have not been solidified into any one thing. That is important, because number and shape then become things that are more like tools and less metaphysical parts of material reality. In that sense Euclid is modern, though he lived during the time of Ptolemy Soter. Euclid's reality-divorced system divorced can at the same time be applied quite practically to material reality, any metaphysics notwithstanding. He and his system thus reside in the realm of hypothesis. His way of formulating an argument remains with us in the form of kinds of logical maneuvers, like the indirect proof, and in the form of an attempt at the greatest certainty in theory that may then be applied to material reality in the controlled environment of the laboratory. Thus, Euclid's Elements resides in one half of scientific method, the theoretical. Though there are calls for Euclidean geometry to be less central in school curricula, his Elements remains a staple of educational systems across the globe. The way Euclid structured and proved his Elements was perhaps what made mathematicians and thinkers believe his treatise is the definitive work on space and spatial relations. Its most significant influence, however, is as an axiomatic and deductive framework that was itself copied, and indeed significantly modified, through millennia. Elements is the theory of math made manifest, and science needs theory in order to make the falsifiable test. The structure of Euclid's Elements continues in the format of almost all scientific reasoning. [i] A few scholars say that some mathematicians are Platonists while others are “constructivists.” For more on the debate as to Euclid's philosophy, see Maziarz and Greenwood, Zeitler. [ii] Proclus and Pappus respectively. [iii] Some of which include calculations about prime numbers, incommensurability and others that have since been approached by means of algebra. For more on this topic and an excellent review of portions of Elements, see Gjersten. [iv] One number theory incorporated into Elements is the Fundamental Theorem of Arithmetic, which states that every number is either a prime number or a product of prime numbers in one way only. For an articulation of this theorem, see C. M. Taisbak in Tuplin and Rihill. Greek mathematics is static, as opposed to dynamic. Modern goemetry is dynamic in that it contends with relative space while ancient geometry thought of itself as finding eternal figures. For more on precisely how numbers and geometry are synthesized in Elements, see Unguru, Kline. Hilbert (1918) talks about the interrelations of logic and mathematics with respect to science in general. [v] Elements was so successful that it was copied down and most probably edited to its detriment. The confusion of axioms as opposed to postulates is one possible result. Axioms are things that are a part of our thinking, without which we cannot reason. Postulates are suppositions that things are a certain way, but not necessarily integral to our very kind of reasoning. An 1884 article claimed that Euclid as a textbook was used nowhere but England. One wonders how Euclid made a return, as he must have done. For more on this issue, see Cornelius Lanczos, Ziwet. [vi] It is interesting to note that mathematicians do not employ the same methods. While Euclid's method is mathematical it is also logical. These two cannot be separated, really, but the form of proof varies as does the form of logic. Logic is not monolithic in the sense that there is one way to pursue the practice, and mathematics is similar. A famous mathematician, Gauss (quoted in Rav 135-6), said that types of proofs and methods varied greatly by scientific discipline. P.A.M. Dirac (1931) claimed that mathematics will shift as progress is made, a view consistent with A. Szabo who claimed that the axiomatic method was connected to the dialectical method. Logic and math are versatile indeed and Elements can still be used as a means for understanding proofs (McClure). For more on the similarities and differences between logic and mathematics as well as the nature of mathematics, see Rav, Cellucci, Hintikka, Feferman, Langevin, Jeans, Eves and Newsom, Aley, Court. [vii] The style and rigor Euclid employs may coincide with the author and work he is currently proving. B.L. Van der Waerden says that “when Euclid is guided by a first rate author, such as Theatetus or Eudoxus, he is himself excellent; but when he copies from a less eminent author, his standard goes down.” Maziarz and Greenwood point out that there are three steps to a Euclidean demonstration: enunciation, the proof and the conclusion. For more on the structure of the proofs, see Maziarz and Greenwood, Russo, Adler and Wolff, McKirahan, Lee. Lee and McKirahan talk in detail about precisely how Aristotle influenced Euclid. Kneale among others points out that Aristotle does not employ if...then statements for good reason. Euclid uses if...then statements regularly; indeed these kinds of statements are thought to be more mathematical. For the alternate idea that Euclid is not axiomatic, at least in Book I, see A. Seidenberg. J. Hintikka believes that axiomatic reasoning is fundamentally not mathematical. For more on the definition of axiomatics, see Blanche. [viii] Euclid was influenced by Plato as well as Aristotle in how he reasoned. For more on this issue, see Maziarz and Greenwood. Russo details some of the ways Elements is specifically structured as Plato and Aristotle required. Howard Bloom gives a good basic review of the layout of Euclid's Elements. [x] Later thinkers were to find that Euclid's theory of space simply does not work with relative systems of thought. Jefferson Hane-Weaver says that “Euclid's geometry is fine for a slate or a sandy beach where points stay put at least some of the time but it is of no use in outer space where there is no central reference point against which position coordinates can be compared. …. Space must be augmented with time and change before it makes any sense in a physical context.” Willem deVries further asserts that no axioms, in the modern scheme of thinking, are adequate to ground empirical knowledge and Robert Downs claims that over small areas the difference between Euclidean and non-euclidean geometry is slight, but covering large areas requires new geometries. These new geometries were created by Nikolai Lobachevsky and Bernhard Reimanian. Reimanian geometry was later used by Einstein in his theories and the new geometries inspired art, like Lewis Carroll's Alice in Wonderland and HP. Lovecraft's madness and horror. The discovery of non-euclidean geometry gave mathematicians a deeper sense of the relative rather than the absolute. For more on the new geometries and how Euclidean geometry is “the beginning of mathematical physics”, see Freely, Downs, Bardi, Carnap. Later thinkers also found subconscious use of assumptions, most importantly postulate 5 used to prove itself. For more on the fall of Euclid's Elements and the debate that surrounds it, see Stillwell. Gjersten. If George Sarton is to be believed, Euclid's genius demonstrated itself merely in postulating I.5, since there is no proof of it. The evolution of scientific thought would not have been possible without Euclid's geometry being superseded by non-euclidean geometry. The transition from Newtonian physics to relativity theory was based upon such new ideas, which were themselves impossible without treatises like Elements (See Moore). [xii] For a good summation and review of all thirteen books, see Artmann. One ought to keep in mind that works prior to Elements were not complete, sometimes with too long proofs. Others left out significant aspects, like proportion and some even started with introductions that merely attacked rivals. These prior texts contained much unnecessary material. [xiii] The idea that equals subtracted from equals are equal, for example, Euclid takes from Aristotle's Prior Analytics (22). H.D.P. Lee claims that Euclid's definitions correspond to Aristotle's definitions, Euclid's common notions to Aristotle's axioms and Aristotle's primitive existence claims to Euclid's PI-PIII. [xiv] Aristotle believed that first principles of geometry ought all to be self-evident, so axioms and postulates ought to be self-evident. [xv] One notable exception is the fifth postulate. Remarkably, for many centuries geometers occupied themselves trying to prove it. This postulate is pivotal to the construction of the whole of Euclid's Elements. In the nineteenth century, when it was denied, or multiplied, the resulting alteration created new geometries, and we continue to construct new geometries now. [xvi] Heiberg, J.L., Euclid's Elements of Geometry, trans. Richard Fitzpatrick, from Euclidis Elementa, edidit et Latine interpretatus est I.L. Heiberg, in aedibus B.G. Teubneri, 1883–1885, 2007. Translations of Elements are derived from this text unless otherwise stipulated. proof. It has yet to be proven and may not be provable. [xviii] John Mumma makes the case that the diagrams of Elements play a vital role in the proof itself. There is perhaps a very empirical role played by diagrams that make a sensible demonstration of some aspect of a proof. If the diagrams are empirical in nature, then there has long been a vital role for empirical aspects of reasoning in Euclid's Elements. The traditional view (Leibniz, somewhat Mueller) sees the figure drawn as independent of the fore of the demonstration. In this view the axioms and theorems comprise the reasoning. Adler, Mortimer and Wolff, Peter. 1960. Foundations of Science and Mathematics. Chicago, London. Aley, Robert J. 1892. “Modern Synthetic Geometry versus Euclid”, Science 20, No. 512: 297- 298. Allman, George J. “GREEK GEOMETRY FROM THALES TO EUCLID”, Hermathena 5, No. 10: 186-235. ______________. “GREEK GEOMETRY FROM THALES TO EUCLID”, Hermathena 6, No. 12: 105-130. ______________. “GREEK GEOMETRY FROM THALES TO EUCLID”, Hermathena 3, No. 5: 160-207. ______________. “GREEK GEOMETRY FROM THALES TO EUCLID. VII”, Hermathena 6, No. 13: 269-278. ______________. “GREEK GEOMETRY FROM THALES TO EUCLID. III”, Hermathena 4, No. 7: 180-228. Apostle, H.G. 1958. “Methodological Superiority of Aristotle over Euclid”, Philosophy of Science 25, No. 2: 131-134. Artmann, Benno. 1991. “Euclid's "Elements" and its Prehistory”, Apeiron: A Journal for Ancient Philosophy and Science 24, No. 4: 1-47. _____________. 1991. Euclid–the creation of Mathematics. New York, Berlin. Bardi, Jason Socrates. 2009. The Fifth Postulate: How Unraveling a Two-thousand-year-old Mystery Unraveled the Universe. New Jersey. Blanche, R. 1962. Axiomatics. London. Brown, Edwin L. 1978. “DAMOETAS' RIDDLE EUCLID'S "THEOREM" 1.32”, Vergilius, No. 24: 25-31. Carnap, Rudolph. 1974. An Introduction to the Philosophy of Science. New York. Casanova, Carlos Augusto. 2006. “Metaphysical Notes Concerning Hilbert and His Studies on Non-Euclidean and NonArchimedean Geometries”, Teorema: Revista Internacional de Filosofia 25, No. 2: 73-93. Cassity, Turner. 2010. “Euclid Disproven”, The Classical Outlook 87, No. 3; 108. Cellucci, C. 2005. “Mathematical Discourse vs. Mathematical Intuition,” in Mathematical Reasoning and Heuristics, C. Cellucci and D. Gillies (Eds. ): 137. London. Court, N.A. 1948. “Is Mathematics an Exact Science?”, The Scientific Monthly 67, No. 2: 119- 123.
deVries, Willem A. 2011. “Sellars and the Myth of the Given,” in Michael Bruce and Steven Barbone (eds.). Just the Arguments: 100 of the Most Important Arguments in Western Philosophy. West Sussex. Dirac, P.A.M. 1931 “Quantised singularities in the electomagnetic field,” Proceedings of the Royal Society of London 133: 60-72. Downs, Robert B. 1982. Landmarks in Science: Hippocrates to Carson. Littleton Colorado. Dunlop, Katherine. 2009. “Why Euclid's Geometry Brooked No Doubt: J. H. Lambert on Certainty and the Existence of Models”, Synthese 167, No. 1: 33-65. Eves, H. And Newsom, C. 1958. An Introduction to the Foundations and Fundamental Concepts of Mathematics. New York. Feferman, S. 2006. “Are There Absolutely Unsovlable Problems? Gödel's Dichotomy,” Philosophia Mathematica (3) 14(2): 134. Gjersten, Derek. 1984. The Classics of Science: The Study of Twelve Enduring Scientific Works. New York. Glasner, Ruth. 1992. “Proclus' Commentary on Euclid's Definitions 1,3 and 1,6”, Hermes 120: 320-333. Gomez-Lobo, Alfonso. 1977. “Aristotle's Hypotheses and the Euclidean Postulates”, The Review of Metaphysics 30, No. 3: 430-439. Guggenheimer, Heinrich. 1977. “The Axioms of Betweenness in Euclid”, Dialectica 31, No 1/ 2: 187-192. Halberstadt, William H. 1967. “In Defence of Euclid: A Reply to B. Meltzer”, Mind, New Series 76, No. 302: 282. Hane-Weaver, Jefferson. 1987. The World of Physics: a Small Library of the Literature of Physics from Antiquity to the Present. New York. Harris, D. Fraser. 1916. “The Influence of Greece on Science and Medicine”, The Scientific Monthly 3, No. 1: 51-65. Hilbert, D. 1918. “Axiomatisches Denken,” Mathematische Annalen 78: 405-415. Hintikka, J. 1980. “Aristotelian Axiomatics and Geometric Axiomatics,” in Proceedings of the 1978 Pisa Conference J. Hintikka et al. (Eds. ): 133-144. Jones, Philip Chapin. 1946. “Kant, Euclid, and the Non-Euclideans”, Philosophy of Science 13, No. 2: 137-143. Karasmanis, Vassilis. 2000. “On the first Greek mathematical proof”, Hermathena, No. 169, Essays on the Platonic Tradition: Joint Committe for Mediterranean & Near Eastern Studies: 7-21. Karpinski, Louis C and Robbins, Frank E. 1929. “Michigan Papyrus 620; the Introduction of Algebraic Equations in Greece” Science, New Series 70, No. 1813: 311-314. Kneale, W. & M. 1971. The Development of Logic. London. Kock, Anders. 2003. “Differential Calculus and Nilpotent Real Numbers”, The Bulletin of Symbolic Logic 9, No. 2: 225-230. Lanczos, Cornelius. 1970. Space through the Ages: The Evolution of Geometrical Ideas from Pythagoras to Hilbert and Einstein. London and New York. Langevin, Paul. 1930. “L'orientation actuelle de la Physique,” in L'orientation actuelle des Sciences by L. Brunschvicg. Paris. Lee, H.D.P. 1935. “Geometrical Method and Aristotle's Account of First Principles,” Classical Quarterly 29:113-24. Leibniz, G. 1896. New Essays Concerning Human Understanding. New York. McClure, J.E. 2000. “Start Where They Are: Geometry as an Introduction to Proof,” The American Mathematical Monthly 107, No. 1: 44-52. Moore, Charles N. 1935. “Mathematics and Science”, Science, New Series 81, No. 2089: 27-32. Mueller, Ian. 1969. “Euclid's Elements and the Axiomatic Method”, The British Journal for the Philosophy of Science 20, No. 4: 289-309. Mumma, John. 2010. “Proofs, pictures, and Euclid”, Synthese 175, No. 2: 255-287. Netz, Reviel. 2010. “What Did Greek Mathematicians Find Beautiful?”, Classical Philology 105, No. 4: 426-444. Peterson, Ivars. 1992. “Off the Beat: Euclid's Crop Circles”, Science News 141, No. 5: 76-77. Pritchard, Paul. 1997. “"Metaphysics" Δ 15 and Pre-Euclidean Mathematics”, Apeiron: A Journal for Ancient Philosophy and Science 30, No. 1: 49-62. Rav, Yehuda. 2008. “The Axiomatic Method in Theory and in Practice,” Logique et Analyse 51, No. 202: 125-147. Ritchie, A.D. And Milne, E.A. 1942. “The Philosophical Status of Physics”, Philosophy 17, No. 65: 76-81. Rogers, Reginald A. 1906. “ON A THEORY OF GEOMETRICAL PROPORTION”, Hermathena 14, No. 32: 205-208. Sabra, A.I. 1969. “Simplicius's Proof of Euclid's Parallels Postulate”, Journal of the Warburg and Courtauld Institutes 32: 1-24. Sarton, George. 1954. Ancient Science and Modern Civilization. Seidenberg, A. 1975. “Did Euclid's Elements, book I, Develop Geometry Axiomatically?,” Archive for History of Exact Sciences 14(4): 263-295. Staal, J.F. “Euclid and Pāṇini”, Philosophy East and West 15, No. 2: 99-116. Stenius, Erik. “Foundations of Mathematics: Ancient Greek and Modern”, Dialectica 32, No. 3/ 4: 255-290. Stillwell, John. 2002. Mathematics and Its History. New York. Suppes, Patrick. 2011. “Future development of scientific structures closer to experiments: Response to F.A. Muller”, Synthese 183, No. 1 THE CLASSICAL MODEL OF SCIENCE II: THE AXIOMATIC METHOD, THE ORDER OF CONCEPTS AND THE HIERARCHY OF SCIENCES: 115-126. Simons, Peter. 2011. “Euclid's context principle”, Hermathena No. 191: 5-24. SÜHEYl ÜNVER, A. 1947. “Avicenna s Praise of Euclid”, Journal of the History of Medicine and Allied Sciences 2, No. 2: 198-200. Szabo, Arpad. 1960. “Anfänge des euklidischen Axiomensystems,” Archive for History of Exact Sciences 1, No. 1: 37-106. Taisbak, Christian Marinus. 2002. “Euclid's Elements 9.14 and the Fundamental Theorem of Arithmetic,” in Science and Mathematics in ancient Greek Culture. Tuplin and Rihill eds. Oxford and New York. ______________________. 1991. “Elements of Euclid's "Data"”, Apeiron: A Journal for Ancient Philosophy and Science 24, No. 4: 135-171. Unguru, S. 1991. “Greek mathematics and Greek induction,” Physis, 28: 273-89. West, Susan. 1980. “The Roots of Science”, Science News 117, No. 21: 332-333. Wolff, Francis. 2000. “Les principes de la science chez Alistóte et Euclide”, Revue de Metaphysique et de Morale, No. 3: 329-362. Zeitler, Herbert. 1990. “Axiomatics of Geometry in School and in Science,” For the Learning of Mathematics 10, No. 2: 17-24. Ziwet, A. 1884. “Euclid as a Text-Book of Geometry”, Science 4, No. 92: 442.